Wow! Pinterest seems to have gone mad for my rainbow smoothie and breakfast smoothie recipes. 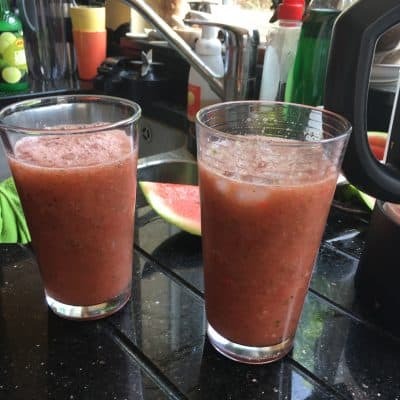 So when we decided to make a watermelon smoothie today, it made sense for me to photograph and blog it. 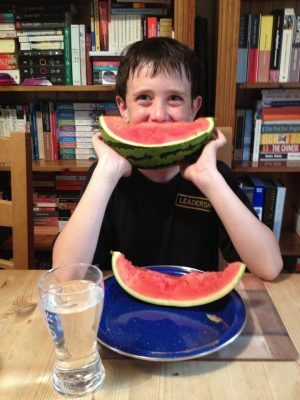 My son has always been a bit of a watermelon nut. 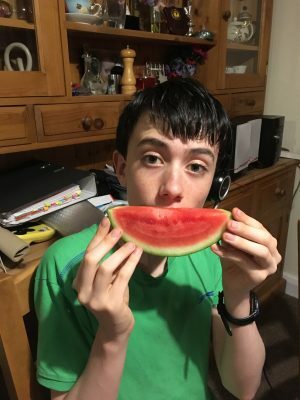 Even when he was very small he could happily eat a piece of watermelon bigger than his head, and now he is a teenage in full growth spurt mode there is no stopping him. 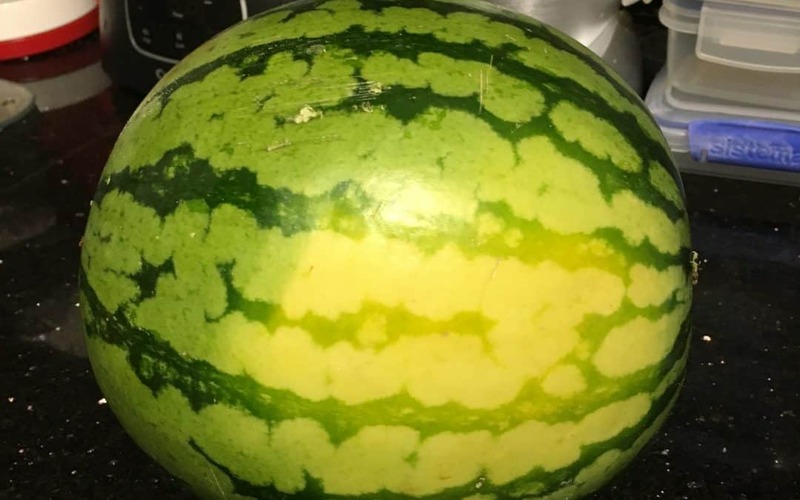 The small piece in the picture is only that size because I wated to turn the rest of the melon into a yummy watermelon smoothie cooler for us. Watermelon is really good for you too. 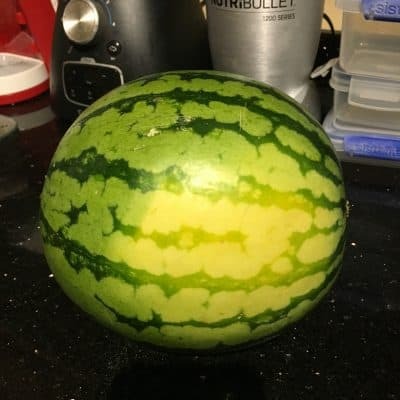 According to this article from Live Science it contains significant levels of vitamins A, B6 and C, lots of lycopene, antioxidants and amino acids, and a modest amount of potassium. Plus, this quintessential summer snack is fat-free, very low in sodium and has only 40 calories per cup. Lycopene is a phytonutrient, which is a naturally occurring compound in fruits and vegetables that reacts with the human body to trigger healthy reactions. Lycopene has been linked with heart health, bone health and prostate cancer prevention. It’s also a powerful antioxidant thought to have anti-inflammatory properties. Recent studies have found that watermelon seeds are also wonderfully nutritious, especially if they are sprouted and shelled. They are high in protein, magnesium, vitamin B and good fats. 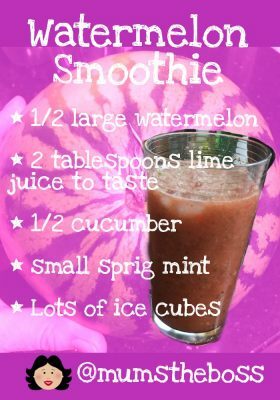 So a watermelon smoothie sounds like a fabulous idea for giving my son something he loves and which is good for him too. We went out walking the dogs on one of those muggy days – very hot,, but with a thundertorm brewing. We all got a bit overheated so I threw this recipe together, which worked out beautifully. As with most smoothies this is pretty straightforward. 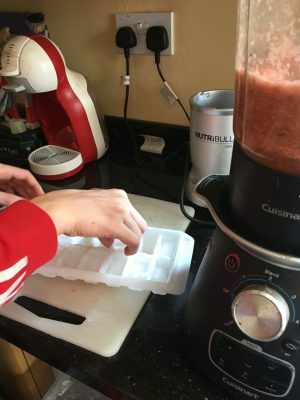 We threw the watermelon and all the other ingredients except the ice into the smoothie maker and blended until all the pips were broken up and it wasn’t so chewy. 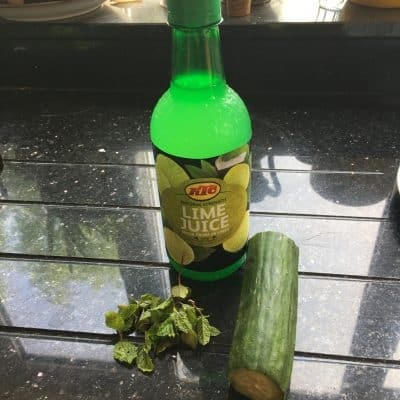 Then we checked the flavour – I was worried I might have added a bit too much lime or mint and maybe it might need some sugar or honey, but mine was absolutely fine. So my son then threw in a whole trayful of ice cubes and we whizzed it again until the ice was nicely crushed. It was absolutely delicious! The colour of ours was a bit sludgey as we opted to keep the cucumber skin, but the taste was amazing. If I was a drinker I might add vodka to it – possibly gin to make a nice cocktail? But as I’m not (and my 13 year old son is a bit young too!) then we just slurped it as it was, and very nice it was too! Please feel free to share your watermelon drink combinations, as I suspect we will be buying a lot of watermelons this summer.